Self-confidence grows when you nurture and respond to needs. Help your explorer stay safe. Toddlers can eat bite-sized food! Take good care of yourself: Know when you’re stressed out. Talk about how things fall, roll, and bounce. Prevent cranky toddlers by feeding them at the same time every day. Toddlers with lead poisoning may not look sick. What’s it like to be 15-16 months old? Naming helps your child’s language development. Use bath time for fun and learning. Let your child know she is important to you. Your child’s view of herself is determined by the way you and others treat her. If she sees that she is treated as important and competent by the people who are important to her, then she will feel she is valued. Your child needs to know that you continue to love her even when you don’t like what she does. She needs to know that you expect a lot from her — and that she needs to learn how to act in loving and helpful ways — AND you will always love her. Respond to your child’s needs and interests. Because you care for her, play with her and respond to her needs, she learns how valuable she is. She is finding out that you believe in her ability to learn and develop new skills. She needs your care, guidance, and respect as she continues to grow. The ideas in this newsletter will help you guide your child to feel loved and competent. I like to climb on things, and I usually like to do it alone. I can climb up stairs on my hands and knees. I can climb out of cribs, high chairs, and strollers. q I’m always on the go. I can walk pretty well. I can run a little. I like to carry things in each hand. I want to show you how independent I am by doing what I want, not what you want me to do. I can turn pages in a book, a few at a time. I like to turn switches on and off. I like to throw things, push things, and pound on things. I like to spin wheels. q I like playing with spoons, cups, and boxes. I don’t play very long with any one toy. I like to carry around a soft doll or toy animal. I like playing in sandboxes. I like rolling a ball with you. When you ask me to, I can point to my shoes or parts of my clothing. I can let you know what I want by the way I talk or point. I can point to pictures you name, if the things in the pictures are familiar to me. I am learning to talk back and forth with people. I don’t usually like having a whole story read to me. I would rather point to pictures in a book and have you talk to me about them. I am beginning to say “no” a lot. I like to feel different kinds of things (such as smooth things, rough things, and soft things). I may not like things that stick to my fingers. I can throw a small ball but I usually throw it crooked. I may be able to build a tower of two blocks. I can scribble with a pencil or crayon. I mostly want my own way; I may not cooperate much. I like lots of attention. I can tell when someone I know is not around. I can recognize myself in a mirror or photograph. I’m pretty self-centered and often not friendly. I like to copy the way you do things like sweeping the floor, setting the table, or raking the lawn. If you show me that you like what I do, I will do it a lot. Sometimes I will get things for you. I like to know where you are at all times. I’m not very good at giving —but I like to get things. I like to do things for myself but I don’t do them very well. I can let you know when I have wet or soiled pants, but I’m still too young to be toilet trained. I may be able to use a spoon, but I spill. Some children do things earlier or later than described here. Most differences are normal. Focus on what your child can do and get excited about each new skill. If you notice that your child is lagging behind in one or more areas for several months, circle the things that your child cannot do. Check the things your child can do. Use this list to talk with your doctor about your child’s development. Using power control (hitting or spanking, use of force, and taking away objects or privileges). It also includes withholding affection or refusing to speak to the child. Giving the child reasons —explaining in simple ways that the child can understand why she should behave in certain ways. It is telling her how the forbidden actions could hurt her or harm others. Children learn how to behave and how to cooperate when they understand the reasons behind the rules. Over a period of time, giving reasons builds respect between the parent and child. It also teaches children how to use reasons with their friends. If your child throws sand at other children, giving reasons is more likely to stop the sand throwing and teach how behavior affects others. Using power might be yelling at her or hitting her. Giving reasons might be telling her that throwing sand could hurt other children — and she must stop. By now, your child has become an expert at putting things in his mouth. The bad news: lots of things go in his mouth that don’t belong there. The good news: your child can begin to feed himself. It also means you can eat at the same time your toddler does. He will be watching you and will try to do what you do. When he sees you eating with a spoon, he will want to try eating with his spoon. (Child-size spoons are sold at most grocery stores.) He will still eat most foods with his fingers. More good news: your child can begin eating the same foods you eat. There is no reason to buy special junior baby foods. You can make your own toddler foods by mashing, dicing, chopping, or shredding the food you eat into small pieces that are easy for him to chew and easy to swallow. Introduce only one new food at a time. A plate full of new foods is too much to deal with. Pair a food she’s never tried with one she likes. Pay attention to texture. Toddlers may not like foods that are slimy, grainy, or crunchy. Start with smooth-textured foods like corn, potatoes, chicken, or pears. Cut food into bite-sized pieces. Your child is more likely to try a food if she can pick it up. Be a role model. Your child will probably try a new food if she sees you eating it. Serve yourself some of the food, and ask your child to taste it with you. Talk about the food. Tell your child what the food is called. Talk about its color and texture. Ask your child to touch and smell it, but don’t pressure her to eat it if she isn’t ready. Take little steps, and celebrate any success. Trying a new food is a big risk for children. Touching the food, smelling it, chewing it, and swallowing it are all parts of trying a new food. If your child puts a new food in her mouth and then spits it out, praise her for at least trying it. Some children won’t eat a food the first time they see it. That’s normal, It could take 7-15 times before your child eats a food she’s never eaten before. Children have to learn to like new foods. Forcing your child to eat something new can make her less likely to try the food later, and more likely to dislike it. Parents choose and prepare healthy foods – and do their best to make mealtime happy. Children decide what and how much to eat. More children die and more children are disabled due to injuries than all diseases combined. Toddlers do not know how to protect themselves. As a parent you worry about the illnesses your child may get and you take special care to protect him. You must take the same care to protect him from accidents. Your child cannot protect himself. Watch your child at all times. Young children are growing and developing every day. Their ability to do things changes suddenly. Often accidents happen because parents are not aware of what their children have just learned to do. Protect your child from falls with stairway gates and window guards. Don’t leave chairs near kitchen counters, tables, windows or cabinets. Keep your child away from hot stoves and heaters. Avoid scalds by turning the water heater down to 120°F. Lock doors that lead to dangerous areas. Keep dangerous substances locked up or safety capped. soil contaminated by leaded gasoline. Since toddlers put everything in their mouths, watch them carefully. Remove all items in your home and yard that may contain lead. If you renovate your house or refinish furniture, be careful that your child does not get dust or chips from the old paint in his mouth. Some folk remedies contain lead. Only give your child medications prescribed by a doctor. If you think your child has eaten lead, ask your doctor to check your child for lead poisoning. Children with lead poisoning don’t always look or act sick, at least not at first. Lead poisoning often shows up as tiredness, grouchiness, upset stomach, headaches, or loss of appetite. Sometimes there are no signs at all until serious damage has occurred. Your toddler is learning how things move. If he likes dropping something from his high chair, give him a paper napkin to drop and let him watch how the air moves it. Bounce! Give him a sponge or stuffed toy to throw. He likes to hear the sounds things make when they hit the floor. Splat! Tell him the names of things and what they do. Roll, bounce, splat. He will soon find out that things that go splat get your attention. Keep time to music. 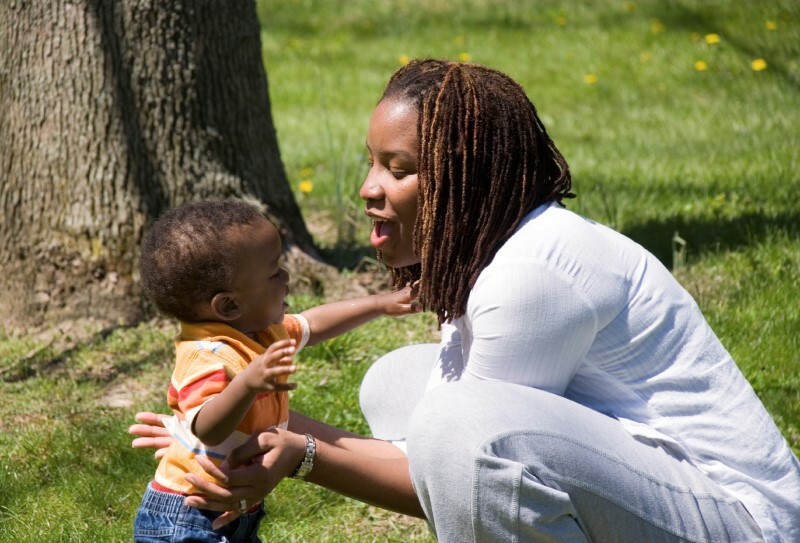 Bounce your child gently on your knee or lap or clap with him in time to music. You will both have fun moving with the music. Let him have space indoors and outdoors to practice crawling and walking. He is going to be running by the end of the year. Right now, let him practice, practice, practice. Toddlers are on the move! They are crawling, scooting, and walking. Their world is full of new things to touch, throw, climb on, and to fall from or knock down. You need lots of energy. Your quiet, cuddly baby has become a lively little person and that means you have to be lively too. That can be fun, but it can make you tired, anxious, or angry. Give yourself the care you need to feel rested, healthy and energetic. Playpens are okay when you need to rest or to calm down, but keep playpen times brief. 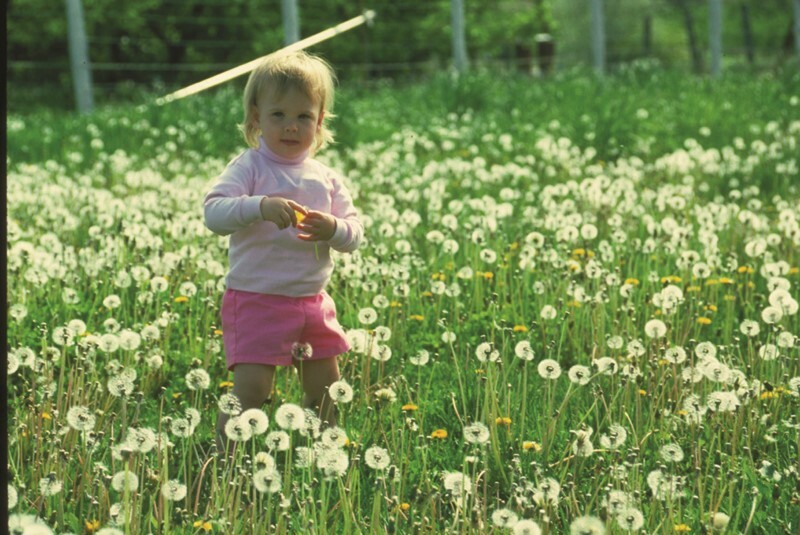 Help your child discover new things safely. Learning about her surroundings makes her feel good about herself and her world. “Where is _____ ? ?” helps your child learn to turn pages and look at pictures. Sit with your child on your lap. Read a picture book to your child. 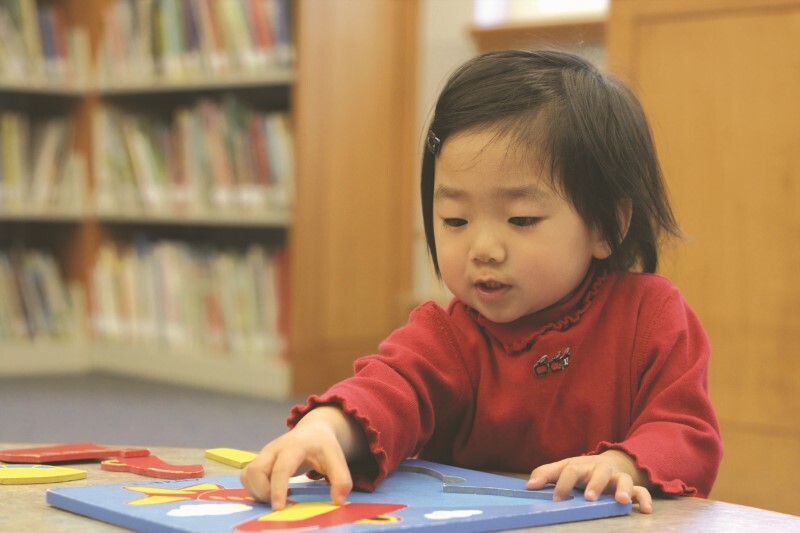 Reading alone helps your child learn small motor coordination. If yes, turn the pages of a book or magazine a few times and point to some pictures. Let your child look at the book alone. Give your child meals and snacks at about the same time every day. He will feel better if he knows he is going to have food at regular times. If he doesn’t, he is apt to be crabby and cranky. He might overeat when he finally does get food, because he is not sure when he is going to eat again. Eating in the morning gives your child energy. He might not want to eat just after he wakes up. That’s OK. He will probably be ready for food in a half hour or so. Regular healthy snacks are important. Children have small stomachs and may get hungry within a couple of hours after a meal. Snacks at midmorning and mid afternoon keep him healthy. Plan to eat at about the same time every day. Most people eat a meal around noon, and they may eat another meal about 5 or 6 p.m.
You can plan the times of meals around what you have to do during the day. If your child refuses to eat at mealtime — but then asks for a snack immediately afterwards — you may want to tell him he must wait until snack time. Help your child learn to eat the healthy foods you’ve prepared. If your child doesn’t want to eat what you’ve prepared, don’t fix something different just for him. Remind him that this is what everyone in the family is eating. Tell him it will be a while before the next meal or snack. If he still insists he is not going to eat, quietly remove his plate. Let him leave the table if he wants to. You may feel like you have too much to do, not enough time, not enough money, nobody to help out. If you feel that way sometimes, you’re not alone. We all feel like the world is closing in sometimes. Some stress is good for us – it makes us want to get up, get moving and get things done. When stress gets too heavy, it can hurt you. You might have headaches or trouble sleeping. You may feel angry all the time, even when nothing is happening. Stress can do real harm to your health and your relationships with your family, children, and friends. Stress is normal. Learn to recognize the signs of stress in your own body – so you keep it at a good level, and don’t get too stressed. You may feel your muscles tighten, your hands might sweat, or your breathing might get heavy and fast. Find help for too much stress. Talk to others about how you feel. Try different ideas for coping with stress — self-help groups, parent stress hot lines, exercise and/or time out for yourself. Take charge of managing your own stress. Find out what works for YOU. Take an extra minute or two at bath time to let your child have fun. Keep some toys just for water play. Plastic containers, measuring cups, spoons, and funnels all make fine bath toys. Be sure to wash them before giving them to your toddler. Name body parts. 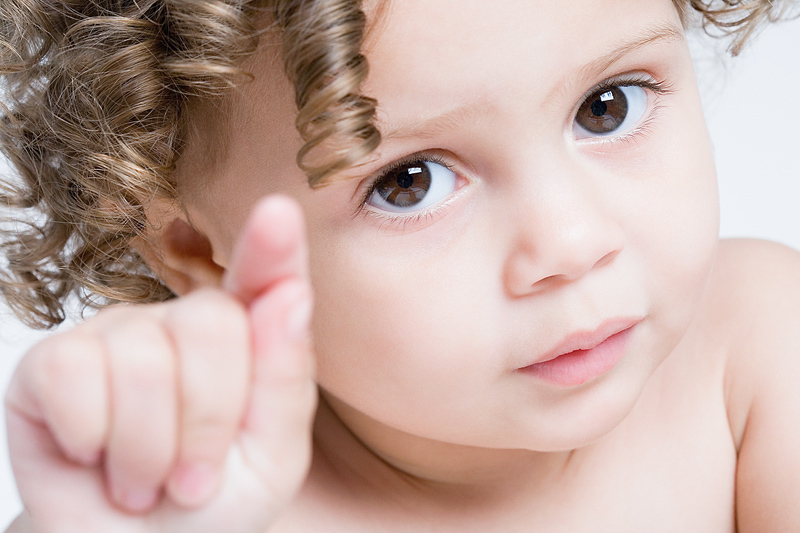 Point to each body part while you say, “Here’s your nose; here are your eyes.“ Soon your child will be able to point to the right part when you say the name. Remember always to stay in the bathroom with your child. She is not old enough to bathe alone and could easily fall or slip under the water. Just in Time Parenting is an educational partnership of educators and researchers from land-grant universities across the country.